It’s a trouble spot that GOP leaders and tax writers need to work through if they want to shore up votes for the bill, which they hope to bring to the floor next week. Republicans can lose no more than 22 votes (assuming full attendance) if they are to pass a bill without Democratic support. Lawmakers covering a broad spectrum of the House GOP conference, including the hard-line Freedom Caucus members, the Republican Study Committee conservatives and the Tuesday Group moderates, are pushing for changes to the small-business provisions before the bill reaches the floor. “That’s probably number one, the whole pass-through on the small businesses,” RSC Chairman Mark Walker said Monday evening. It’s not just members who are objecting. Small-business groups, such as the National Federation of Independent Business, are opposed to the bill. Under current law, small businesses organized as sole proprietorships, partnerships, limited liability companies, and S-corporations, known as pass-through entities, are taxed at the individual owner or shareholder level. That means these owners are paying taxes on their business income at tax rates, which top out at 39.6 percent. The GOP bill would create a 25 percent small-business tax rate that would apply to all passive investment income, such as interest, and to a portion of active income, including profits and salaries. The active income portion comes with limitations that tax writers have described as “guardrails” to prevent abuse of the reduced rate. Owners and shareholders of pass-through entities have two options for calculating their tax rates for active income. One is to have 30 percent of such income taxed at the reduced rate while the remaining 70 percent would be subject to individual income tax rates. The alternative is to apply a formula based on their level of capital investments that could result in a higher percentage of income being taxed at the 25 percent rate. The catch for those choosing the formula method is that they are bound to it for five years. Many members have said the formula favors capital-intensive businesses, such as manufacturers, and leaves service providers, including doctors, lawyers, accountants, architects and plumbers, with a higher tax bill since they do not qualify for the 30/70 taxation method. The National Federation of Independent Business agrees that the guardrail is poorly designed. The NFIB’s other concern is that the 25 percent rate is too high to reduce taxes for the majority of small-business owners. Mozloom said 85 percent to 90 percent of his group’s roughly 300,000 members would not get a tax cut because they don’t make more than $260,000 in taxable income. That’s the threshold at which the bill’s 35 percent individual tax rate kicks in. People making less than that amount wouldn’t pay more than 25 percent in taxes anyway. The NFIB is asking tax writers to consider graduating the small-business rate up to 25 percent, with a bracket or two under that. Ways and Means Chairman Kevin Brady reiterated Wednesday that no decisions have been made yet but they’re working on small-business improvements. Members, however, seem less fixated on the pass-through rate than the overall result. 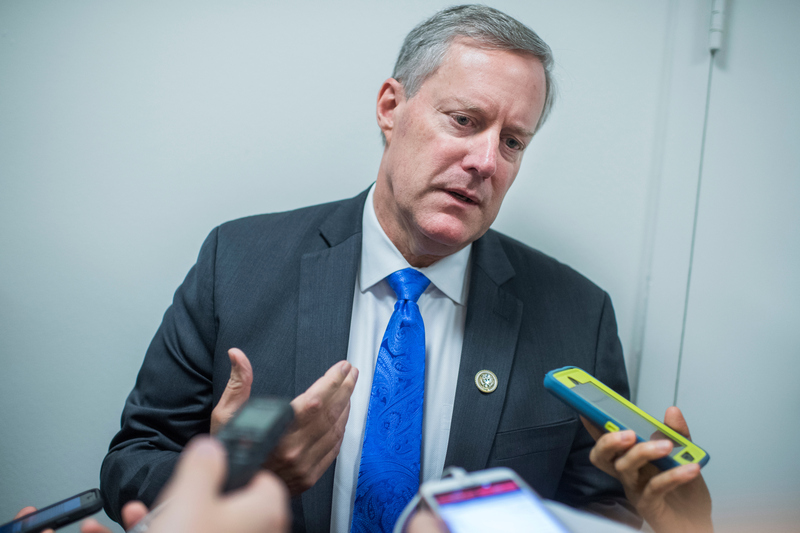 Freedom Caucus Chairman Mark Meadows said he’s run numbers for some of the small businesses in his district based on the provisions in the bill. “They are not necessarily better off,” the North Carolina Republican said. While at home in South Carolina last week, Freedom Caucus member Mark Sanford said most of the feedback he got on the tax bill was from small businesses. He described the “stumbling block” as this: A passive investor would benefit from the full 25 percent rate while the business owner who’s doing most of the work could be taxed at 39.6 percent. The Freedom Caucus members discussed the need to improve the small-business language during their weekly meeting Monday and identified repeal of the individual mandate as a possible offset for any pass-through changes. Most members interviewed for this story said leadership is listening to their concerns and they’re optimistic the language will be tweaked, with several predicting changes will be made during the House Ways and Means Committee markup this week. “That’s probably what’s got the most energy right now, and I think they’ll make some adjustments,” Walker said. Tuesday Group Co-chairman Charlie Dent also acknowledged the energy behind making changes to the pass-through provisions. But the retiring Pennsylvania Republican has a different concern. He wants to ensure the guardrails in place are tight enough that high-income individuals can’t form an LLC, for example, and try to claim the reduced rate. New York Rep. Chris Collins, a Tuesday Group member, said most of the members don’t understand the pass-through provisions so any changes are not necessarily designed to get them on board. House Chief Deputy Whip Patrick T. McHenry acknowledged that leadership is trying to address complaints about the small-business provisions, but he stopped short of guaranteeing changes. “We’re trying to make sure the policy is right and actually delivers [the] impact we want it to deliver,” the North Carolina Republican said.